I got up early today as I wanted to make the batter for malpua. Many communities in India prepare gujiyas on Holi but Gujaratis prefer to make them for Diwali. I decided to make some malpua. I did not manage to get some khoya or mawa so I googled for alternatives. I came across some malpuas made with mashed banana. I thought that the recipe would be good as it meant less sugar. So, as required I let the batter rest for 4 to 5 hours before attempting the task of frying the malpuas. Unfortunately, they were a disaster. The batter kept on sticking to the bottom of the pan and refused to come up. Instead of wasting oil, I just stopped after 2 attempts. I made pancakes with the rest of the batter but was really disappointed. What is it that some bloggers forget to tell us in their recipes? The consistency was right, the oil was heated to the required temperature, so what went wrong? That means that for this Holi I cannot blog a sweet dish. The best malpuas I have ever had are made at the ISKCON in Juhu. But my pumpkin sabji tasted good so am going to share the recipe with you. My mum made the most simplest and yummiest pumpkin sabji or shaak as we call it. I remember once she even got a deep cut on her wrist while trying to peel the pumpkin. The sharp tip of the knife just went into her wrist. First Aid and haldi saved the day. So be very careful when you peel the pumpkin. The skin tends to be very hard. Pumpkin is full of carotenoids which is good for the eyes, minerals like potassium, magnesium and zinc, Vitamins A and C and a rich source of fibers. Good for the skin, a diuretic, good for the stomach and many other benefits. So have pumpkin regularly as a vegetable, soup or even roasted. Heat the oil in a wide pan over medium heat. When it is hot, add cumin seeds. Add green chillis and ginger and fry for a few seconds. Add turmeric powder if the pumpkin is pale in colour. If it is deep orange then there is no need to add it. Add the pumpkin cubes and salt. Mix well and cover the pan. Lower the heat and let it cook till it is just done. Keep and eye on it as you don’t want to pumpkin to overcook. 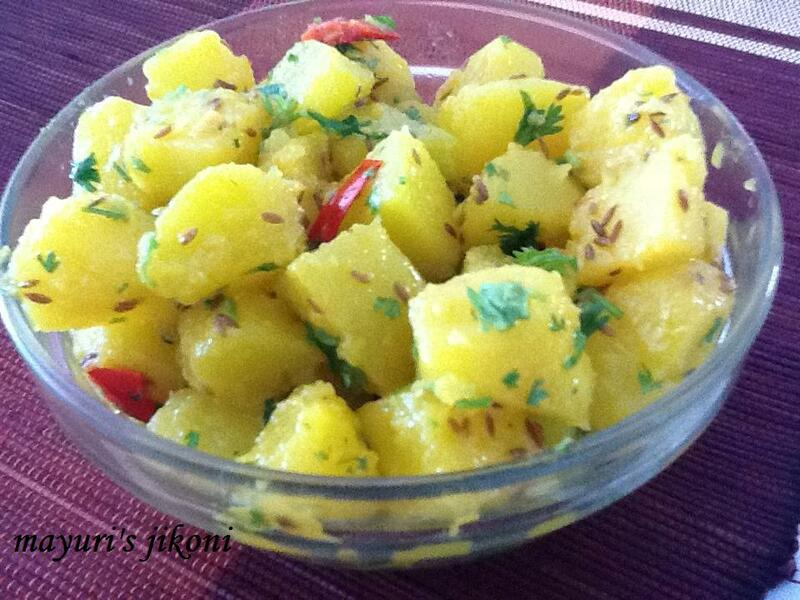 Mix in the lemon juice and garnish with fresh chopped coriander and serve with hot rotlis or parathas. I used fresh red chilli to make the sabji appear colourful. Can use thinly sliced ginger if you like. Add 2 tbsps of water if the pumpkin takes too long to cook. If you are not serving the sabji immediately, take the cover off and cover it with a net cover. You don’t want mushy pumpkin. Heat it up before serving.